Microsoft's Aaron Greenberg still isn't a big fan of the Wii apparently and, despite the fact the diminutive console is trouncing the competition in terms of sales, thinks that the little white box is little more than a fad. 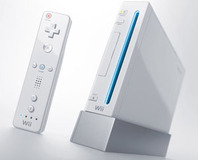 In comments made to Gamasutra, Greenberg talked about why he thinks the future for the Wii is limited, discussing the problems Nintendo may have with customers. "You see they're not buying games on it, right? It's like something they break out when people come over, and it's maybe a fun thing, but it's almost like the same people that buy a karaoke machine, you know? They're not really buying it for games, they're just buying it as a novelty," said Greenberg. According to Greenberg Microsoft and Nintendo are aiming at different audiences and with different aims, so there is less competition than you might expect. Instead, Greenberg thinks that the Xbox 360 is a great complement to the Nintendo Wii, despite it being little more than a fad, apparently..
"In this generation we're seeing record revenues for the US and globally for the business, and we're seeing more people buying and playing games than ever before, and the Wii is definitely part of that. And as they grow that pie, that benefits us too, because those customers are eventually going to want to graduate to an Xbox 360 experience." What do you think? Is the Wii good for parties and nothing more? Let us know in the forums.